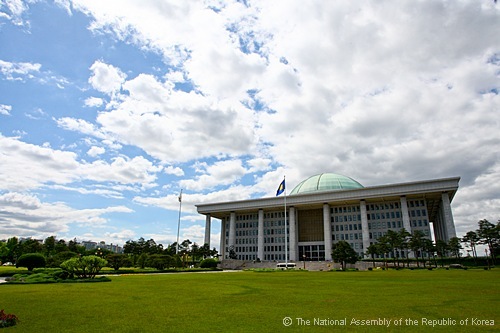 The National Assembly is a place where 299 elected representatives discuss political issues, manage state finances, and make laws on behalf of the Korean people. The place may sound boring or far removed from our everyday life, but it sees a number of visitors everyday who want to get a glimpse of this huge political machine. 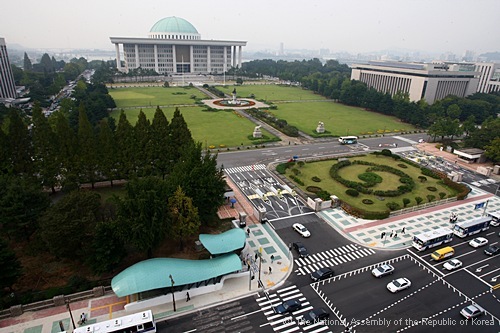 So let’s join the crowd and tour the National Assembly of the Republic of Korea. Get off at aptly named National Assembly Station of subway line 9 and you’ll see a green-domed building beyond a large grass lawn. That’s the National Assembly building where people can see the dynamics of Korean politics. Here’s Ms. Kim Hye-kyung of the Visitors’ Center. 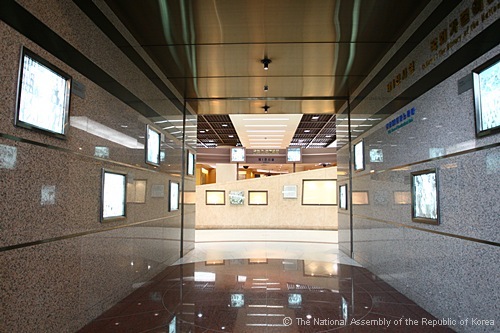 There are two places in the National Assembly open to the public. The first one is the plenary chamber and the next is the National Assembly Memorial Hall where people can see the parliamentary past. 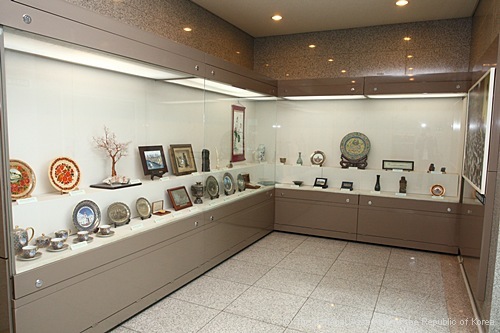 The tour is certain to satisfy people’s curiosity about dynamic Korean politics. You must make reservations for the tour three days in advance and stop by the Visitors’ Center before the tour to get clearance. Today, the center is bustling with young. - I wanted to see how lawmakers work. - I got curious about the National Assembly while watching TV. - I want to find out about the parliament and the government. - I came to teach children about the workings of the National Assembly and the jobs of elected officials. The tour begins with an introductory video presentation. Once the video presentation over, the tour begins in earnest. Two grand staircases leading from the lobby take people to the second floor. 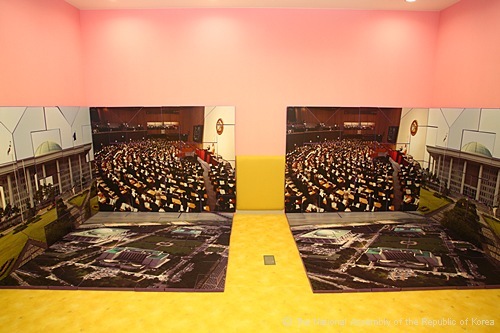 The photos of former National Assembly Speakers are hung on the left side wall in the lobby. Who is the highest-ranking official of the National Assembly? It’s the Speaker and this is the Speakers’ Hall, where documents and photos of past Speakers are kept. Parliamentary representative’s term is four years and the Speaker’s two years, but the Speaker can serve many times in a row. Who has the longest record? It’s Speaker Lee Ho-seon who served for eight years. Who’s the current Speaker? It’s Park Hee-tae who was elected in June with the highest vote share. 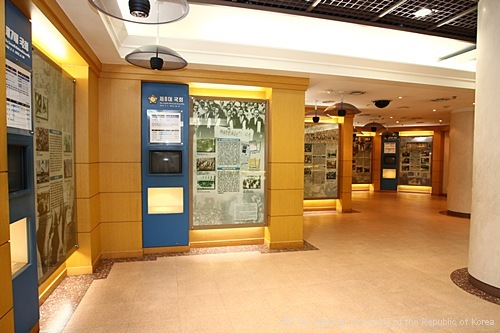 The Speakers’ Exhibition Room contains the documents describing the former Speakers’ activities, personal artifacts, and souvenirs received during their tenures. 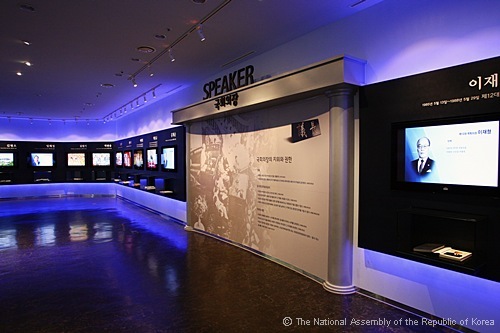 Next to the Speakers’ Exhibition Room is Gallery 1, History of the National Assembly, where people can see the parliamentary history of Korea at a glance. Here’s tour guide Kim Hye-kyung again. The constituent assembly was established in 1948 and the current parliament is the 18th one. 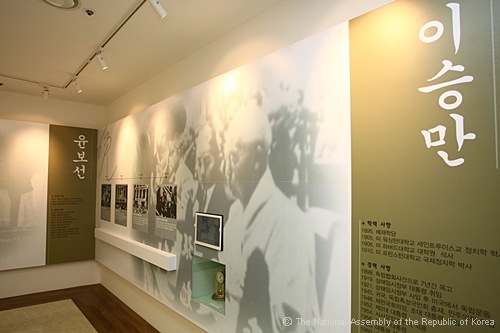 In 1948 only South Korea held a parliamentary election to elect 198 representatives. At the time the colonial government building inside Gyeongbok Palace was used as a plenary meeting room. 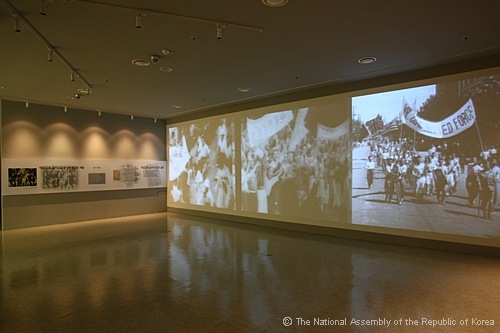 During the Korean War the parliament held its meetings near Busan in southern Korea and the assembly moved to a building next to Seoul City Hall after the war. The National Assembly moved to the current site in Yeouido in 1975. 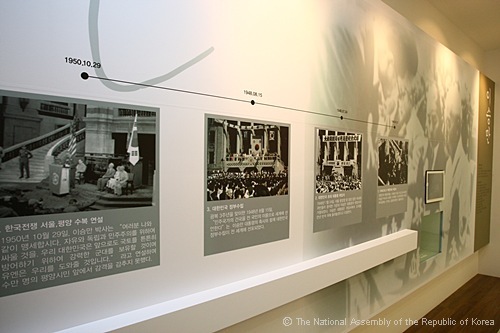 The National Assembly building has stood witness to the changes in the Korean political scene since 1975. 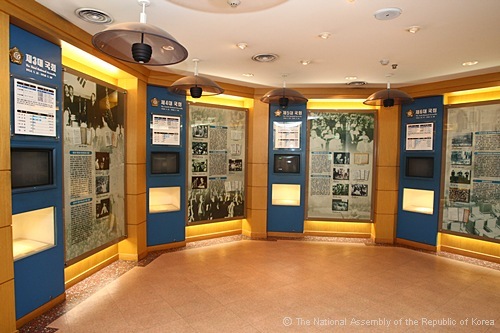 Gallery 1 of the National Assembly Memorial Hall features documents and photos of major parliamentary activities, parliamentary election systems, and changing political party history. 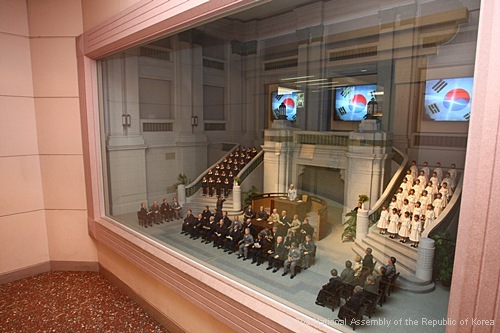 Visitors can see the most popular destination of the National Assembly Memorial Hall on the second floor – the Presidents Room. This room has in display many records and artifacts of ex-presidents who used to be lawmakers. Korea had ten presidents so far. Do you know how many of them were parliamentary members? Seven. Which president won the Nobel Peace Prize? Yes, it was President Kim Dae-jung. He also holds the record of giving the longest speech to the assembly for five hours and 19 minutes. That was when there was no time limit. Visitors can take photos sitting behind a replica of the presidential desk against the backdrop of the president’s office. 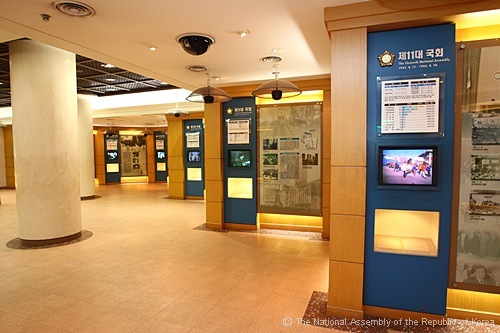 Gallery 2, named Serving the People, features touch screens to find out more about the authorities, organization, and operation of the National Assembly. 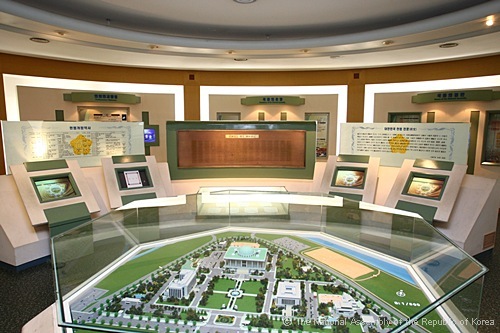 Here, visitors can play the role of lawmakers in a mock assembly session. A large screen is place in the front and 45 seats fill the mock assembly room. Visitors experience what it’s like to carry out legislative activities. Children shout out “I’m a lawmaker” before the session begins. The screen lights up and the children are taken across the Yeouido Plaza and inside the plenary meeting room. The video shows the Speaker entering the room and announcing the start of a session by pounding on the gavel. It’s exactly like what actually goes on in a parliamentary meeting. Lawmakers can vote on a bill by pressing either a red or a green button next to the chair. The young guests appear to have had a great time experiencing the legislative process. It certainly has been an eye-opening experience for the future leaders of our nation. -It was amazing how a law is made. I didn’t know the process before, but now I’m glad to have found out. - It was interesting to legislate. Now I want to become a lawmaker. - It was interesting and amazing to pass a law. I think legislation is a serious business. Now that the tour of the National Assembly Memorial Hall is over, let’s walk over to the tour’s highlight, the main assembly building where plenary sessions are held. Korea’s National Assembly building is the largest one in Asia, taking up one-eighth of the entire Yeouido area. The green dome of the building represents the unity of the Korean people, and weighs in at 1,000 tons. The octagonal pillars of the building symbolize the eight provinces of Korea. Here’s tour guide Kim Hye-kyung to explain more. The National Assembly building is easy to spot and contains many architectural meanings. The 24 columns of the building represent 24 traditional seasons of Korea or 24 hours in a day. They’re the manifestation of the parliament’s resolve to work hard around the clock for the people of Korea. The dome symbolizes the horizontal consensus-building process of lawmakers, how diverse opinions are harmonized through dialogue, persuasion, and compromise. Once inside the domed structure, visitors can see that the building houses one basement floor and seven aboveground floors. The central lobby is open to the top floor, creating an airy and uncluttered atmosphere. Visitors are lucky that they meet up with a Grand National Party lawmaker Lee Kyeong-jae in front of the plenary meeting room. Welcome to the National Assembly. This is where the plenary meeting is held. This is where a final poll is held before passing a bill. The first feature grabbing people’s attention in the plenary meeting room is the National Assembly symbol located behind the Speaker’s chair. It’s Korea’s national flower, the rose of Sharon, surrounding the Chinese character “guk” meaning “nation,” which is encircled in the gold border. GNP representative Lee continues his explanation of the meeting room’s layout. Do you see the Korean flag and that high chair in the front? That’s where the Speaker presides over a meeting. And you know about the stand where lawmakers ask questions and address the assembly, right? Government officials stand a little below that to answer questions. There are also four chairs there and those are for assembly stenographers, who record the questions and replies word for word. The records are kept as testimony to what went on in each session. The plenary meeting room taking up three floors is fan-shaped. The Speaker’s chair is situated in the center or the narrow part of the room and the lawmakers’ seats fan out from there. 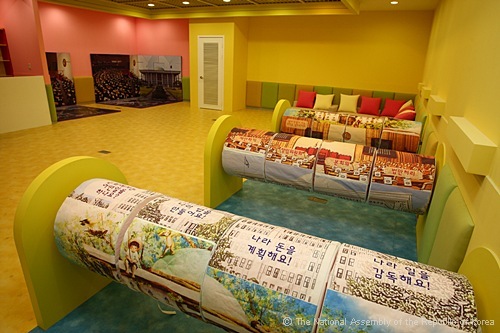 The seats are movable and the room is big enough to accommodate 400 seats just in case the unification of South and North Koreas calls for more representatives. 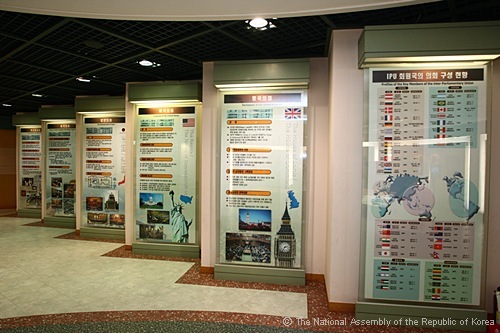 In addition to the National Assembly Memorial Hall and the main National Assembly Building, the National Assembly Library is also a popular attraction drawing many visitors every day. 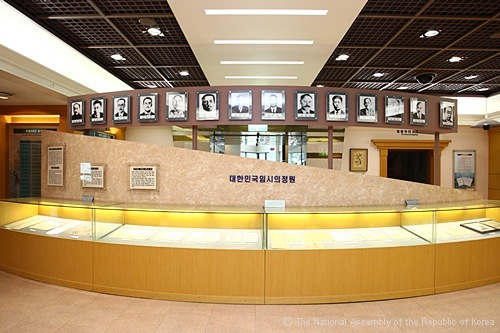 The National Assembly Library is known to house just about every document, dissertation, and book in Korea. The tour of the National Assembly comes to a close with a visit to the National Assembly Library. Now it’s time to ask visitors what their impressions of the nation’s legislative branch was like. - Legislation was a remote issue for me. But now I know how difficult it is to work as a lawmaker and how close politics is to our everyday life. - I didn’t know whether I could gain an access to the compound. But now that I’ve been inside the National Assembly and talked to people working here, I think people should come see the place for themselves and realize that it’s not an inaccessible place. - Today’s experience taught me that the National Assembly can be familiar and interesting. I learned a lot about the National Assembly. People would feel closer to a national institution if they came and saw the place for themselves. For me, I became more interested in politics. 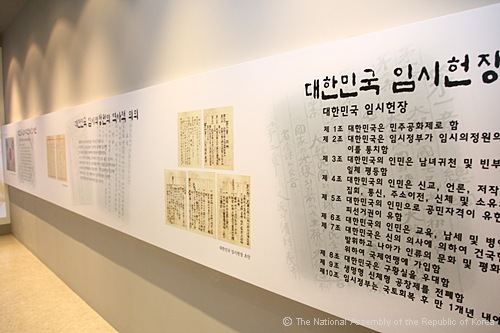 The National Assembly is where lawmakers representing the Korean people exchange opinions and discuss laws and institutions needed to improve the lives of ordinary Koreans. 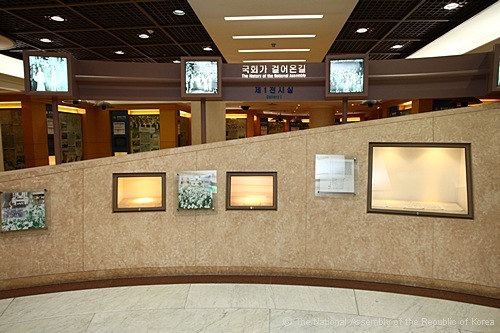 This is where Korean political history is made every day. 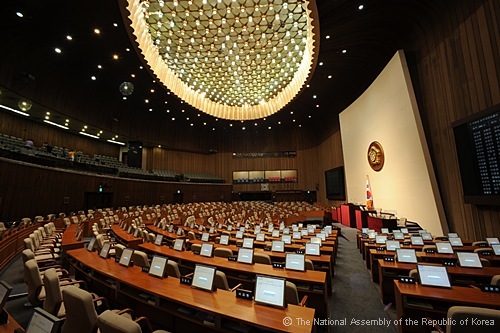 If you are curious about where Korean politics is headed, take a tour of the National Assembly to satisfy your curiosity and learn more about the nation’s legislative mechanism.